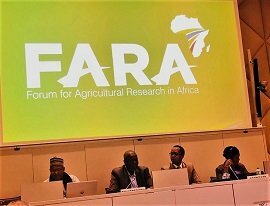 The Forum for Agricultural Research in Africa (FARA) is the apex continental organisation responsible for coordinating and advocating for agricultural research-for-development. (AR4D). FARA serves as the technical arm of the African Union Commission on matters concerning agriculture science, technology and innovation. The Forum for Agricultural Research in Africa (FARA) in collaboration with the Centre for Coordination of Agricultural Research and Development for Southern Africa (CCARDESA) and the Ministry of Agriculture, Irrigation and Water Development of the Government of Malawi are organising a Regional Consultation workshop on rolling-out the Science Agenda for Agriculture in Africa (S3A) for Southern African countries in Lilongwe, Malawi. The meeting took place from Monday, 10th to the 12th of April 2017 with participants comprising Malawi, Seychelles, Swaziland, Zambia, Mauritius, Zimbabwe, Angola, Mozambique, Lesotho, South Africa, Namibia, Botswana. The 8th Africa Agricultural Science Week (AASW8) & FARA General Assembly will be hosted by the North Africa Agricultural Sub Regional Organization (NAASRO) and the Agricultural Research Centre (ARC) at the Egypt International Conference & Exhibition Centre, Cairo from October 28 - 31, 2019. CDAIS is a global partnership on capacity development for agricultural innovation systems. Launched in 2015, the overall objective of CDAIS is to make agricultural innovation systems more efficient and sustainable in meeting the demands of farmers, agri-business and consumers. This will help improve food security. Read more about the�Common Framework on Capacity Development for Agricultural Innovation Systems(pdf). The Science Agenda for Agriculture in Africa (dubbed 'Science Agenda' / S3A) is an African Owned and African-led process that articulates the science, technology,extension, innovations, policy and social learning that Africa needs to apply in order to meet its agricultural and overall development goals. The strategic thrusts of the S3A in the short to medium term are: the implementation of CAADP; increase domestic public and private sector investment; creating the enabling environment for sustainable application of science for agriculture; and to double current level of Agricultural Total Factor Productivity (ATFP) by 2025 through application of science for agriculture.